mmmm interesting- last year i had 4 jacks in my class and i never asked them to pick a new name and this year i have 2 andrews- i just go with it- doesnt matter to me LOL!! oooooo love how the colors pop and the design - love it! Fun layout! Love the bright colors - especially that fun blue with red floral background. Great page! Will she be OK with it if the nickname sticks?! That's too bad they made her have a nickname!! I hope she eventually likes the one she chose!!! My whole childhood, I was just JULIE ... and then I became an adult and EVERYONE wanted to call me JEWELS!!!! YUCK!!! Hate it!! I don't respond to it ... never have, never will!!! lol!!! 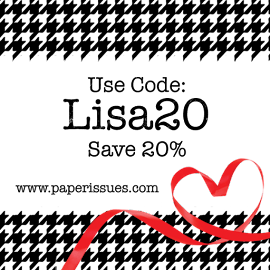 I loveeeeeeeeeeeeeeee your lo!! LOVING the colors, the little phone...and your designs are always AMAZING!!!!!! I hope she will adjust to her name, or stand up for herself to not be called something she doesn’t want to be called!!! Very nice layout! However...I can't believe a teacher would REQUIRE a student to choose a new name! My husband is a teacher and he would never do that! What a bummer about the nickname thing. It does feel kind of off. When I taught, I had several classes where the children had duplicate names. But never with the same last initial. Although, I didn't like calling them (example) Ben A. and Ben S. I just called them by their first and last names when wanting to get their attention. I like this layout a lot--which is always the case. BUT ... that teacher is wrong for asking your daughter to do it. If she wanted that it would be a different case. I supervise teachers and I would not allow that to happen to any student. 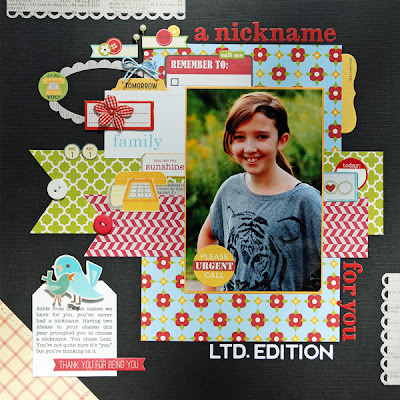 sweet page Lisa, love the color combo! I so like that bright prints against the black background! fantastic pop against the black! Gorgeous! Beautiful layout, Lisa!! Love the black background!! Love how those patterns pop off the black...very strange but if both are picking nicknames it could be a way to bring out their personality? wow~this really is cute, love it!!! Interesting! I've never heard of a teacher doing this either! I've seen them just go with last names, but never asking for a new name! Definitely a scrapworthy event for her!